One of my more recent posts was a bit angry. I was angry about my job, angry about winter, angry about being a working mom, and angry about winter. Well, although I will always be angry at NJ Transit and, despite the date being March 27th, I am still angry about winter, I reassessed my life, was victim of a tiny intervention with my husband, and learned to make the most out of my less-than-perfect work life balance. It isn't ideal but I have been a champ at getting up early and exercising before work. Not only is this better for my mental health and the mental health of those around me - it is my Me Time before the start of the day, it is my time to be selfish, let out aggression, and keep my waistline in check. Because no one else is a wake, I don't feel like I am sacrificing any family time and it actually helps me stay awake during the day. Oh those crazy endorphins! I may have jumped the gun with my professional angst in some ways because I seemed to have forgotten than I haven't been a "new" employee since 2008. I was so used to having accrued vacation days, having a strong relationship with my boss, and a firm understanding of the organization's culture that I forgot how to adjust and adapt to a new company. Once I remembered that I had to earn my stripes, I found myself more at peace with the do's and don't of the Employee Handbook (however asinine some of the bullet-ed points are). I needed to be patient and see what responsibilities developed as I grew into my new role and met more people in and around the office. People I would be working with directly or indirectly. I needed to be trained before getting my wings and, it is slow going, but I am beginning to see why they needed someone for this position. I also found that I wasn't the only working mom. I may be the lone wolf in my department but there are a few of us that have Proud and Not-So Proud Working Mom moments and want to vent about them. These moms also want to advocate for change in policy, management support, and the earlier mentioned bullets in the handbook. Some, but not all, managers realize times are changing in the workplace and creating an environment of work/life balance is a huge retaining feature. Since I am new, I kind of skulk in the shadows of these meetings and offer my vote, but I love the way that the talks are going - and even that such a group even exists in my office. My commute is still gross but a little less gross than it was thanks to Daylight Savings Time. Walking out of the office, on to the train, and even into my house(!) in the sun has done wonders. I feel like I have more time and that is all I want - with my son, my husband, and in sweatpants. 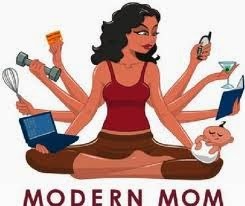 I know there are a lot of Proud Working Moms out there and I would love to know their tricks of the trade. Personally, I now leave any frustrations I have with my commute on the train. I make sure to listen to my husband's day and even though I don't get the quantity, I make sure each minute I have with Austin during the week is quality!